Age-related macular degeneration (AMD) is the most common cause of blindness in individuals over the age of 65. The macula is a small area in the back of the eye that is responsible for central vision and is used when one looks directly at a face, a book or television. AMD is a deterioration or breakdown of this macula area. AMD can cause distortion or loss of central vision, making it hard to do activities such as reading or recognizing a face. Symptoms of AMD may include blurred vision, wavy vision, dark or empty areas in central vision or a patient may not notice much change at all. Sometimes, only one eye is affected with the second eye continuing to see well. AMD can be classified as being “dry” or “wet.” Dry AMD is the most common form of macular degeneration. It is caused by aging changes of the macula that can lead to deposits of debris called “drusen” and/or thinning of retinal tissue called “atrophy.” Vision loss with dry macular degeneration is usually very slow. Although there currently is no treatment for dry AMD taking high levels of antioxidant vitamins has been shown to slow the progression in certain individuals. Not smoking, wearing sunglasses, and eating a well-balanced diet rich in green leafy vegetables and omega-3 fatty acids is also helpful. 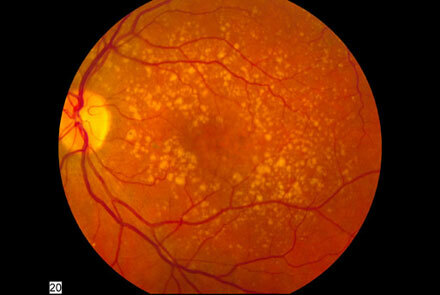 Age-related macular degeneration is considered “wet” if abnormal blood vessels start growing in the macula. These abnormal blood vessels can leak fluid or blood, resulting in decreased vision that may be severe. Fortunately, treatments exist that can stabilize vision and, in some individuals, improve vision in patients with wet AMD. Treatment options include prescription drugs, laser treatments, or rarely, surgery.Age-related macular degeneration is considered “wet” if abnormal blood vessels start growing in the macula. If you think you have AMD or are in any way concerned about you eye health, please get in touch to book an appointment with one of our optometrists.